Christmas is only about a month away. So who gets an early Christmas gift? YOU! 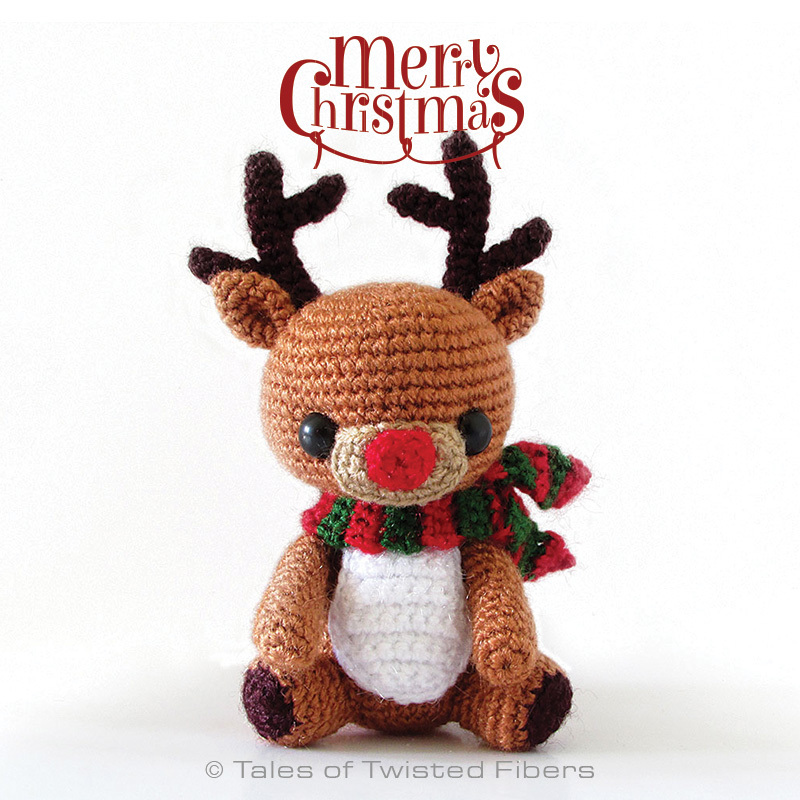 😀 And my gift to you is this super cute free amigurumi pattern for Rudy, the reindeer. Made with sock weight yarn and 2.5 mm hook, Rudy is around 4.5 inches tall. As the pattern only uses basic stitches (if you know how to make a magic ring, single crochet stitch, increase and decrease, you’re set to go!) 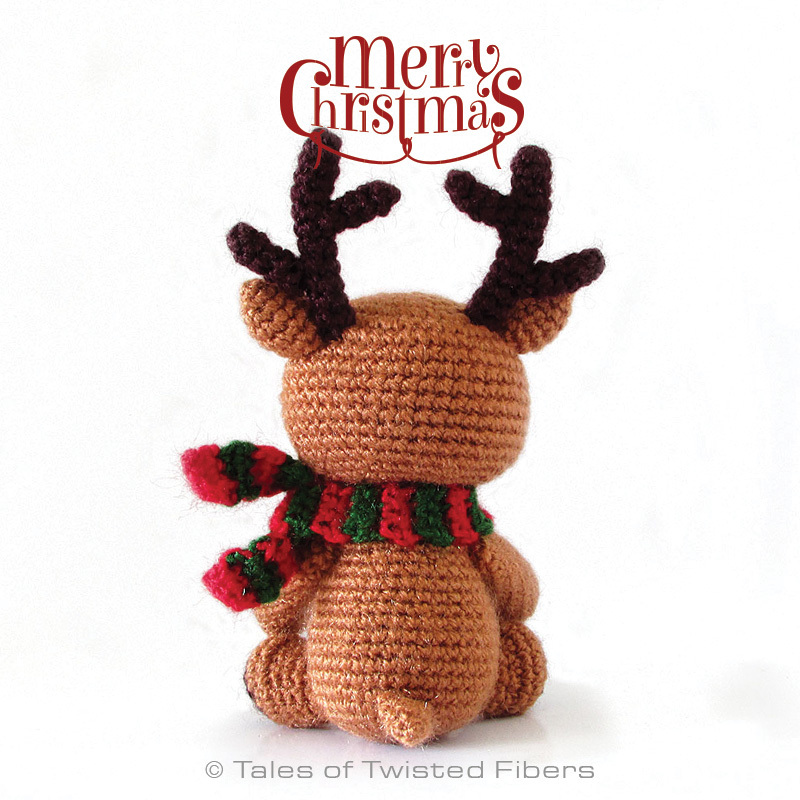 and is relatively quick to make, this amigurumi will make a great Christmas project. This is one cutie you should have around you and your loved ones during Christmas. So download the pattern and start hookin’, folks! Christmas is already around the corner. If you liked this free amigurumi pattern—and also since ’tis the season of giving—would you please consider making a small donation to Animal Nepal? Animal Nepal is a not for profit, animal welfare and rights organization based in Lalitpur, Nepal. It runs two sanctuaries for abused and injured homeless/working animals, besides campaigning for animal rights. If you want to see the wonderful work these folks do, you can check out their Facebook page or their blog. You can also help them by donating here. OMG he is so sweet !!!!! I love it! Thanks for sharing and have a very merry christmas! He is so sweet and I know just the little fella I’m going to make him for. Thanks for designing him. My grandson and a lot of little ones I don’t know will love him so much when I make him and donate him. Know he will be much loved. You’re welcome. I’m very happy you like him. I didn’t keep track of how much brown yarn I used since I was using my scraps but if I have to guess, you will not need more than 30gm. Reblogged this on Chez Lady Sofy. Congratulations on such a beautiful and sweet pattern. I have a publication every Wednesday on my facebook fanpage, called woolly Wednesday, which share Spanish translations of free patterns. would be a pleasure to have a pattern like this in my publications. I hope your answer. This is adorable! If one were to use worsted weight yarn would that work? It would obviously be a lot larger. What size eyes would you recommend for that? 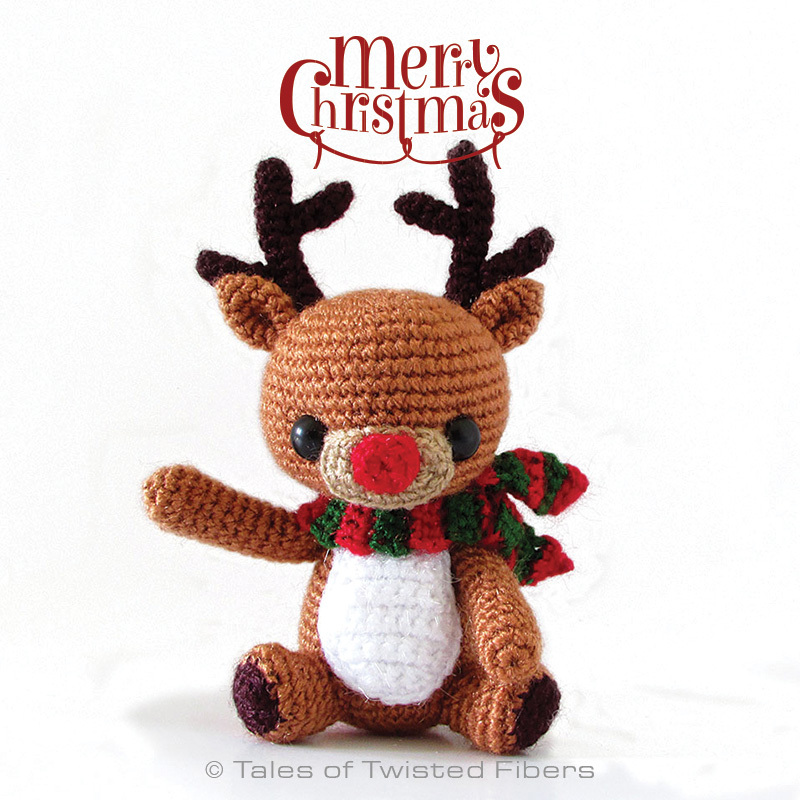 Thank you so very much for this adorable reindeer pattern! I absolutely love Rudi and can’t wait to make one! You think I’m becoming a bit of a fan? You’d be right. Here is another wonderful little crochet pattern from Tales of Twisted Fibers, and again, it’s free. She’s too sweet. Thank you Serah! Thanks so much for the link. I’m so happy you decided to turn him into a Christmas tree ornament. He looks happy there. 🙂 Happy Holidays! This is to cute. I can’t wait to make it. I fell in love with your small reindeer. I created it with some modifications and I looked for your e-mail to ask you for the authorization to publish it on my blog in French because it is strongly inspired of your. Thank you so much for sharing! This is about the cutest thing EVER! Love it so much, and my kids will too! From a French mum who loves crochet! I want to make Rudy for my grandson, but don’t know what kind of yarn was used and where to find it??? I use sock weight acrylic yarn by Vardhman to make my amigurumi. I maybe wrong but I don’t think this yarn company ships its products outside South Asia. As far as I know, they don’t have an online store either. Can I copy your pattern to my facebook? I don’t allow my patterns to be published in their entirety anywhere. However, you can share the image accompanied by the link to this post. Thanks for understanding. (sc, inc) means single crochet in the next stitch, increase in the next stitch. “X 8” means repeat instructions within the brackets 8 times. So when you do 8 sets of (sc, inc), your final stitch count will be 24. Thank you so much.It is a cute pattern and now I can try to make it. About the body part, can you let me know if I should turn the work clockwise every time I see the instruction to “turn” at every row? Or is it for only the first and second rows? BTW I love this project, and look forward to completing it! Oh my gosh, I love this! I was looking for a free reindeer pattern so I could make a Christmas gift for my four year old cousin and I think this is the best one that I’ve seen so far! Thank you for sharing! Thank you! I’m glad to hear you picked my pattern among all the other lovely ones. Gostaria da receita da rena. Obrigada. Hi am I crazy? Lol I dont see the instructions for the legs?? Love this pattern. Thank you so much for taking the time to share!! Yup sure is lol I am using my phone and it completely cut off the left side. Thank you! !